"Through no fault of their own, black dogs are almost always the last to find new homes." While there are tons of dogs out there looking for homes, some tend to have a harder time than others finding a forever family - and so the Scottish SPCA decided to come up with a way to help the "less adoptable" dogs find homes, too. For whatever reason, dogs with darker coats seem to get adopted less frequently than dogs with lighter coats. It doesn't matter what their breed is or what their personality is like. Many dogs get judged for the color of their fur alone, leaving them stuck in shelters for months on end. "Black dog syndrome is something that can affect the adoption of animals in our care," Sharon Comrie, Scottish SPCA superintendent, told The Dodo. "Through no fault of their own, black dogs are almost always the last to find new homes." One of the reasons darker-coated dogs might struggle finding homes is that it's harder to see their features and facial expressions in photographs, and therefore harder for potential adopters to see their sweet and beautiful personalities. 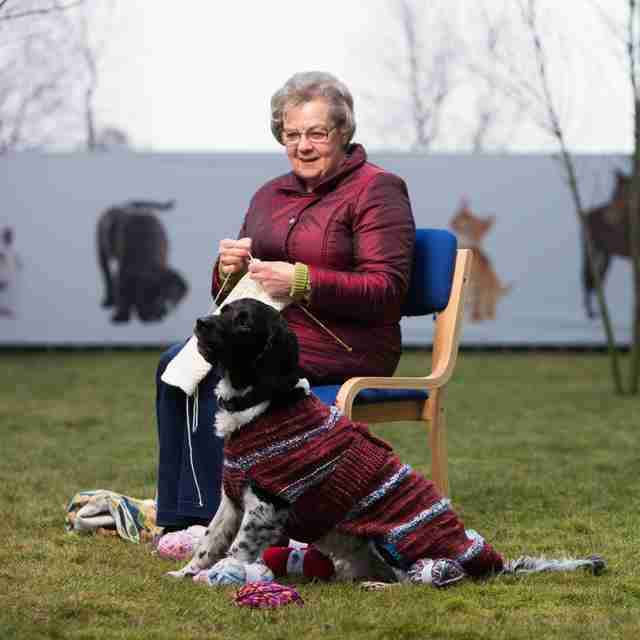 In order to help these overlooked dogs, the Scottish SPCA has partnered with various Scottish Women's Institute (SWI) groups to help knit colorful sweaters for dogs with dark-colored coats to wear. "Knitted jackets are ideal because they will be soft on the skin, have an element of give and stretch, and can be created in any, or many, colors of wool," Comrie said. "With the SWI knitters' support, we will be able to build up a collection of special jackets for our dark dogs to wear with pride." 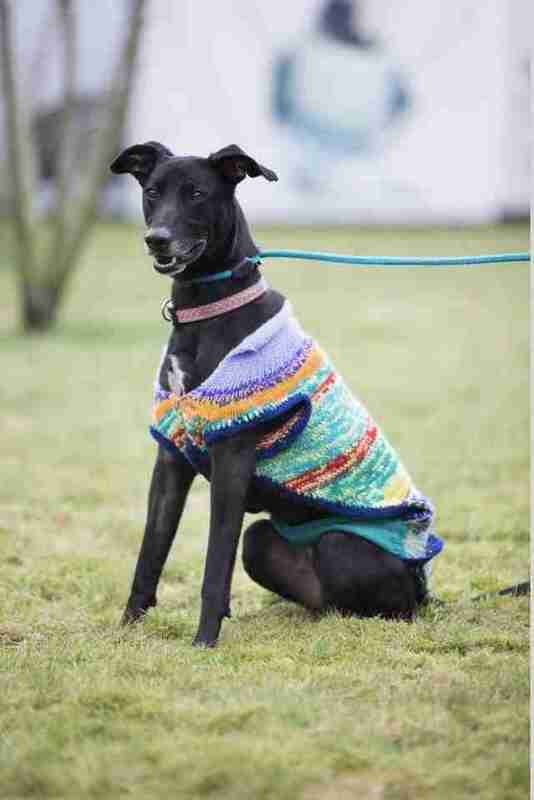 The sweaters will hopefully help dogs who have been struggling for a while to find homes, like Archie, who finds shelter life to be extremely stressful, and therefore doesn't always give off the best kennel presence when potential adopters come to see him. 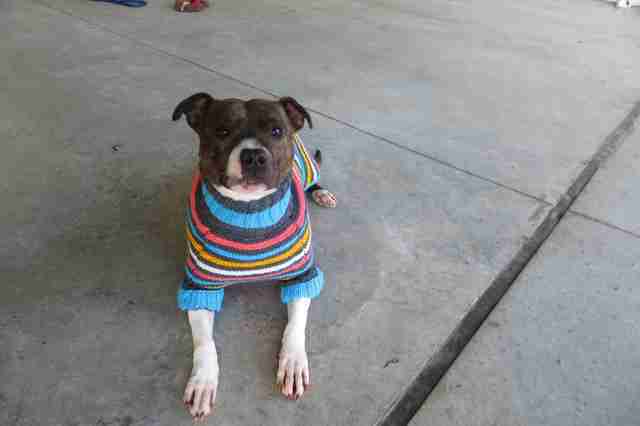 His new colorful sweater helps him look a little more comfy and relaxed, and hopefully it won't be long before Archie gets to leave his kennel for good and join a loving family. "As well as making the dogs stand out, we anticipate that bright-colored jackets will provide a conversation point, but more importantly, help us rehome all of our dogs, regardless of the color of their coat, quickly and effectively," Comrie said. 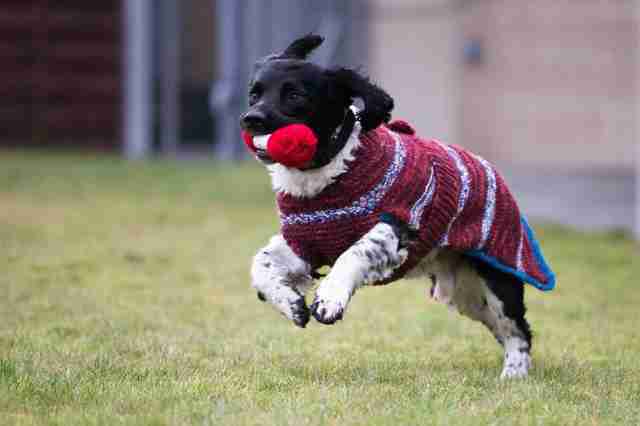 All shelter dogs deserve loving homes, and hopefully these adorable sweaters will help people see that a little easier.